On a January morning in 2016, the commuters at Earl’s Court Underground Station suddenly stopped dead in their tracks. “They saw this bright orange logo and we could see people going ‘my god is easy doing coffee now’ and ‘does it have anything to do with easyJet?’” Nathan Lowry remembers. As a matter of fact, the answer to both those questions was yes. Having hatched the idea just months earlier together with Stelios Haji-Ioannou, founder of the easyGroup family of brands, Lowry had unveiled a new budget coffee chain to disrupt the already crowded and often costly industry – easyCoffee. And it was the first shop in what is quickly becoming a national franchise that pleasantly surprised the commuters. “They were literally queuing out the door,” Lowry, the company’s CEO, says. However, the story began almost a decade earlier when Lowry first met Haji-Ioannou in 2006. At the time Lowry was working in the property sector and was asked to help the world-renowned entrepreneur with a deal for an easyCinema outlet. While the venture proved to be one of Haji-Ioannou’s less successful ideas, it helped set the two on the path towards launching easyCoffee together. “I got to know him quite well through that deal,” he says. As their friendship grew over the next decade, the two entrepreneurs’ conversations often touched upon the subject of new business opportunities, what would work and what wouldn’t. That was the case two years ago when they went out for a hot brew after completing a property deal in New York. “That’s how we got chatting about the cost of coffee, how you could be quite disruptive in the market and we both kind of looked at each other and felt that coffee is just too expensive but that it doesn’t need to be,” Lowry recalls. Given Haji-Ioannou excels at cutting prices, they both recognised the untapped potential in the sector. Not resting on their laurels, they set out to realise the vision. “We went full steam ahead,” Lowry says. During the next three months he secured funding from an angel investor and recruited a highly skilled team from his days in the hospitality sector. But the most vital part of the preparation was undoubtedly to ensure easyCoffee encapsulated the spirit of easyGroup. “[We thought about] what our USP should be [and] how we could work within the easy brand,” he reveals. “[We needed to] create great value, take on the big players, be for the many not the few, [do] relentless innovation, keep it simple, be entrepreneurial and make a difference in people’s lives.” They only introduced the new brand to the world when those elements were in place in January 2016. And Lowry is making no secret of how much the first store’s success relied on ensuring the ethos of the easy brand. “It’s absolutely huge,” he says. Indeed, being associated with easyJet, easyStorage and easyCruise meant easyCoffee had the massive advantage of people already having a relationship with the brand. This meant they knew what to expect from the new coffee chain and were willing to venture into that first store for a hot brew. “I don’t see any other similar brand that could be as successful in the high street,” he adds. While Lowry was eager to grow the company, he decided to scale the business through franchising almost by chance. “It’s quite funny,” he says. “We attended a franchising show, not really sure what to expect at all, and our stand was completely mobbed by people. People had never seen easyCoffee and it was absolutely packed. 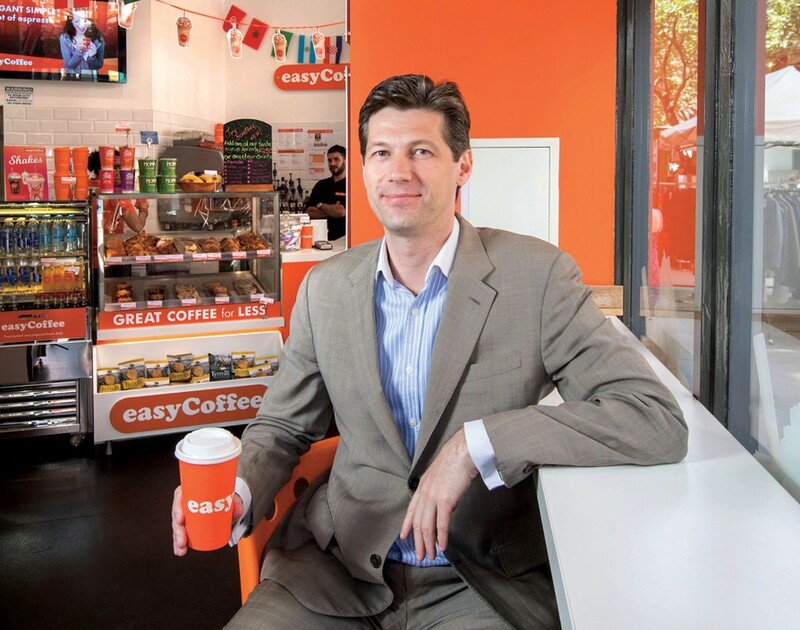 We never sat down during the whole day.” Amazed by the franchising community’s enthusiasm, Lowry recognised the huge potential franchising easyCoffee could have. And it didn’t stop once they left the event. “Over the first couple of years we had well over a thousand formal expressions of interest,” he explains. But eager as the budding franchisor was to get started with franchising, he was careful to ensure they got it right off the bat. “Obviously we had to test it, trial it and build the model carefully,” Lowry states. The key to doing just that was recruiting easyCoffee’s first two franchisees in Burnley. Setting up the first franchise-owned shop also meant the franchisor could draw vital insights from the experience. Following the trial, the franchisor introduced a strong support team at the corporate HQ in London and established a powerful mobile team that could respond to any franchisee query. And it seems as if the franchisees are also happy with the arrangement. “It’s been a great success for them and obviously for us [too] because we built that model in three separate locations where we could show [how our model shops made] very strong profit,” he says. Moreover, the trial highlighted the importance of sourcing the best talent for the business. “We like them to have practical business experience,” Lowry says. Ideal candidates should also be motivated self-starters. “And we want them to have a passion for the easy brand,” Lowry says. While great franchisees are paramount for maintaining easyCoffee’s momentum, finding the right location is equally important. “We’ve never opened a shop with a franchisee that we wouldn’t open as a corporate store,” Lowry says. In other words, before signing off on opening a new branch, the franchisor ensures the new location could be successful in its own right. “We look at it from that angle and then whether it will work well or not with a franchisee,” he explains. It’s only when those two things align – skilled franchisees and great locations – that the CEO gives prospective franchisees his thumbs up. This approach has to date ensured the successful launch of three franchise-owned stores and seven corporate ones. But Lowry is hardly stopping anytime soon. “I hope to have another two stores open by the end of the year,” he says. Having attended the National Franchise Exhibition in October 2018, the franchise is now actively working with prospective franchisees to open new shops with the goal to launch 200 stores across the UK. “It will take at least three years to get there,” he continues. Having secured funding and initiatives like these, it’s clear why Lowry seems confident about the franchise’s future. “Really it’s all about the growth and the expansion of the business now,” he concludes.